Trailhead and parking area are on Arethusa Falls Road in Harts Location, NH. Arethusa Falls Road leaves the west side of Rt. 302 14.5 miles from its junction with Rt. 3. The road is well marked. There are two parking areas a short distance up this road. The lower parking area is larger. The Arethusa Falls Trail begins at the upper parking area. 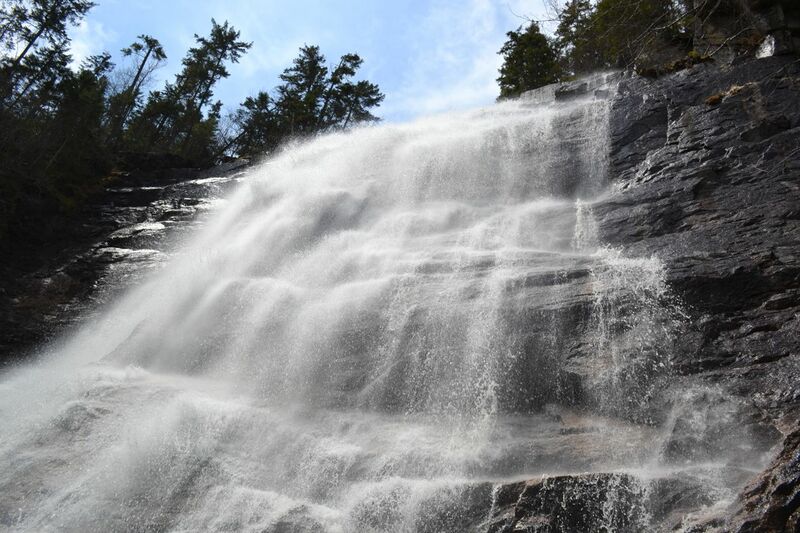 Arethusa Falls is New Hampshire's tallest single drop waterfall, and also one of the most scenic. As you stand in its dominating presence, dwarfed by the immense sheet of crashing white, a sense of awe will overcome you. Unfortunately, it is a very popular place and it is unlikely that you will find yourself alone on this trail, which is a mostly gradual ascent through the forest. To begin the hike, walk to the upper parking lot and locate the trailhead for the Arethusa Falls Trail. Just 0.1 miles into the hike, Bemis Brook Trail forks left. Bear left to escape the crowds for half a mile on the Bemis Brook Trail for a scenic brook walk past two additional cascades. As you follow the trail along the brook, you will first come to Fawn Pool, a sunny pool below a long water slide. Next on the trail is Bemis Falls. Bemis is a short and wide plunge. The second waterfall is Coliseum Falls. This waterfall is more impressive, as it is has three drops. You can observe it as you stand on a rock ledge over the water. Two cascades rush in front of you, while the third is directly below. From here, the trail turns uphill and climbs very steeply until it reconnects with the main trail. Turn left to continue on the Arethusa Falls Trail. The trail then begins to climb slowly. As you near the falls, the trail crosses small streams on two bridges. At a junction 0.8 miles from Bemis Brook Trail, continue straight onto the spur to Arethusa Falls. Arethusa-Ripley Falls Trail goes right, toward Frankenstein Cliff Trail, making a loop over Frankenstein Cliff possible. From this junction, it is 0.3 miles down to the falls. The rushing cataract of Arethusa Falls is majestic. There are plenty of nice spots to sit and enjoy the waterfall. You can also walk right up to the base of the falls to watch it from below.